[FT.com] Aditya Ghosh, the youthful president of IndiGo, says there is no big secret behind the success of India’s only profitable airline in an infamously difficult aviation market. Analysts tend to agree with his assessment. They say that in contrast to Kingfisher Airlines, the debt-laden carrier struggling to avoid bankruptcy, privately held IndiGo has followed the strategy of Southwest Airlines in the US and Europe’s Ryanair: offer only low-cost fares connecting busy destinations using just one type of plane. The president of the five-year-old carrier, owned by Rahul Bhatia, an Indian billionaire, and Rakesh Gangwal, the US Airways former chief executive, says…..
[The Hindu Business Line] Shares in Kingfisher Airlines plunged to a record low of Rs 14 on the Bombay Stock Exchange on Tuesday. All aviation stocks fell on reports of the Government deferring its decision on allowing foreign airlines to invest in domestic carriers. But the fall was steepest for Kingfisher Airlines. While Kingfisher shares closed at Rs 16.05, down 5.03 per cent, SpiceJet lost 2.85 per cent to Rs 29 and Jet Airways was down 1 per cent to close at Rs 341.65. On April 2, Kingfisher had climbed from a previous low of Rs 14.95 on hopes of the FDI proposal getting clearance. However, reports now indicate that the Government could even defer the decision to May-end. Aviation analysts say that allowing FDI may not benefit the aviation industry greatly. Debt-laden airlines like KFA will find it difficult to take advantage of it, they say. “Kingfisher Airlines is unlikely to capitalise on FDI in aviation considering it has less than 7 per cent market share. SpiceJet may stand to gain the most and, perhaps, IndiGo over a period of time,” said Mr Nikhil Vora of IDFC. With the domestic aviation sector witnessing high passenger yields, the key to reviving the ailing airline sector lies in revising the cost structure, he added. 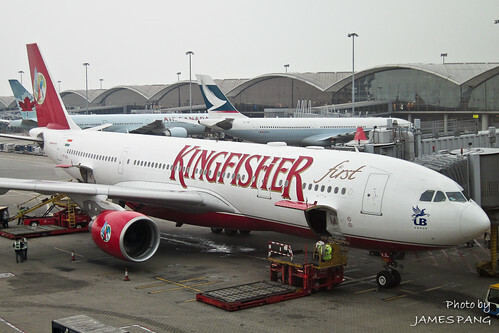 Kingfisher Airlines had reported a net loss of Rs 444.26 crore for Q3 2011-12. The banking consortium, with exposure of over Rs 7,000 crore in the cash-strapped airline, has refused to extend further loans till the company brings in fresh equity. With the account turning sub-standard for all banks, “it becomes all the more difficult for us to consider the airline’s request for additional funding”, said a State Bank of India official. “The airline has to come up with a feasible business plan and show seriousness in turning its fortunes,” he added. Another banker was hopeful that with the airline being allowed to import fuel directly and the FDI coming into place soon, the airline would be able to perform better. 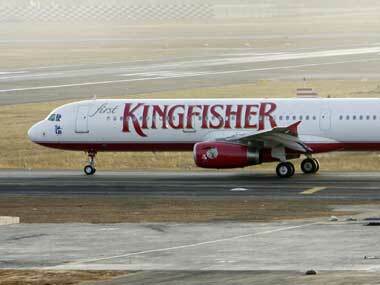 Kingfisher’s continued operations, despite on a…..
Read the complete story at The Hindu Busienss Line section…. NEW DELHI: Three Indian carriers, which have been permitted to directly buy jet fuel from foreign sources, would together import almost 13 lakh kilo litres (kl) of the fuel at a cost of about Rs 5,780 crore for the present. The carriers which have recently received permission from the Directorate General of Foreign Trade (DGFT) under the Commerce Ministry, to import aviation turbine fuel (ATF) are Kingfisher Airlines, SpiceJetand IndiGo. Air India, which has also applied for such an approval, is yet to receive permission to import ATF. The move will help the airlines to significantly slash its operating costs. “All the three airlines have been permitted to directly import ATF,” a senior Commerce Ministry official told a reporter. 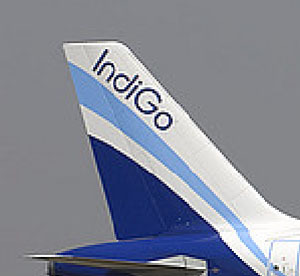 While InterGlobe, owner of no-frill airline IndiGo, got approval to import 7.15 lakh kl worth Rs 3,200 crore of jet fuel, cash-strapped Kingfisher has been allowed to buy five lakh kl worth Rs 2,233 crore. SpiceJet would import only 50,000 kl worth Rs 235 crore, the official said. The three carriers have been negotiating with leading oil marketing companies and were hopeful of beginning fuel imports in due course, a source said. Industry experts have claimed that a mix of taxes levied by state-run oil marketing companies and the state governments make jet fuel prices in India among the highest in the world. Currently, fuel costs account for about 40 per cent of an airline’s total operating costs. Read the full story from India’s ‘The Economic Times’…. Are the fortunes of the heavily troubled Indian aviation industry set to take a turn for the better? Quite possibly, says a report in Business Standard. A reduction in over-capacity caused by significant flight cancellations by crisis-struck Kingfisher Airlines have led to improved yields for other local carriers. The trend looks likely to continue if oil prices don’t spiral out of control. “The finances of airlines would improve in 2012-13 on the back of better pricing of tickets due to rationalisation of capacity. Capacity addition would also be moderate and the airlines would make money,” Kapil Kaul, chief executive officer (South Asia), Centre for Asia Pacific Aviation (CAPA), told the newspaper. Last month, a report by Kotak Institutional Equities also noted that yields (revenues per passenger per kilometre) had stayed strong in the January-March quarter because of constantly reducing capacity by Kingfisher. Still, an improving fourth-quarter won’t make up for all the pain of the past. CAPA expects airlines (including Air India) to post a cumulative loss of $2.5 billion for 2011-2012. Don’t expect any miracles in fourth-quarter earnings either because operating costs for airlines continued to climb.Business Standard points out that while domestic fares for the March-ending quarter climbed 15-18 percent from the previous quarter, it was offset by a 15 percent increase in jet fuel — the largest expense item for airlines – and a 11 percent depreciation in the rupee…..
Read the full story at Firstpost Business…. After a delay of nearly four months, many employees of the embattled Indian airline Kingfisher have been paid. Chairman of the crisis-hit carrier, Vijay Mallya, admitted the salaries had been “seriously overdue”, but that the problem had arisen in the first place because the Indian tax authorities had frozen the company’s accounts. Airline staff had previously written an open letter to Mallya, in it they said that they would stop reporting for duty if the situation wasn’t resolved soon. They also said that they could not give thier full attention to their work during this time due to the financial stress, and that this may lead to it being unsafe for passengers using KingFisher. Kingfisher has been in financial trouble for some time. At one stage it was India’s largest airline by passenger numbers, but is now weathering money troubles, losing on average $1m (£628,000) per day…. Watch the Video Story at BBC News here…. 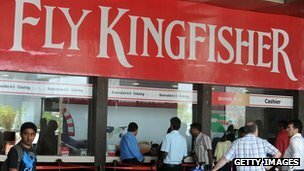 India’s tax authorities have asked Kingfisher airlines to pay 600m rupees ($11.84m; £7.4m) owing in service tax, a finance ministry official has said. The airline’s bank accounts were frozen in February for non-payment of taxes. They were unfrozen on Sunday. The cash-strapped airline owes money to airports, tax authorities, lenders and its own staff. Workers called off a planned strike on Tuesday after an assurance from the airline that they would be paid. “Kingfisher paid 200m rupees service tax last month and they have promised that they will try to pay the arrears as early as they can. Arrears are now about 600m rupees,” chairman of the Central Board of Excise and Customs SK Goel told reporters. “Whatever dues are there, they have to pay. There is no question of leeway. They have to turn over whatever service tax they have collected from you and me,” Mr Goel said. After the airline’s bank accounts were unfrozen, Kingfisher Chairman and Managing Director Vijay Mallya told workers his priority was to pay the staff. Mr Mallya said all junior staff would be paid by Wednesday and engineers and pilots would be paid early next week. The employees initially threatened to go on strike unless they were paid by Tuesday evening, but later called it off. The staff have not been paid since December. The airline has cancelled dozens of flights recently due to the cash crunch. It recently suspended all international operations and cut down on local routes. Kingfisher has been struggling to maintain its day-to-day operations after banks refused to lend more to the debt-laden carrier. The airline has never made a profit since it was launched in 2005. Debt-laden Kingfisher Airlines (KFA) and Air India (AI) have become the first domestic carriers to apply for permission to directly import aviation turbine fuel (ATF) or jet fuel. Direct import of ATF is likely to bring down the operational costs of airlines by 10-15%. Both carriers had filed applications with the Directorate General of Foreign Trade (DGFT), government sources told Hindustan Times. Till now airlines bought fuel from oil marketing companies. The Economic Survey tabled in the Parliament earlier this month had noted that airlines had been affected by high ATF prices because of high incidence of taxes and the decision to allow them to import ATF was likely to improve their operational economics. The AI board on March 27 approved direct import of ATF and the airline would shortly appoint a service provider, who would source the supply as well as provide the necessary infrastructure for storage and distribution of the same for in-plane fuelling. Indian carriers operate in an exceptionally high-cost environment. The single-largest element contributing to airline costs is ATF, which accounts for 40% of the operating cost of Indian carriers, against 20% for international carriers. ATF in India is priced, on an average, almost 60% higher than globally.